For many western managers the approach taken by successful Japanese organisations and their managers has tended to inspire awe, envy and incomprehension in equal measure. But what is so special about 'Japanese' management? And how 'special' is the response of Japanese managers to global business pressures ? This textbook addresses these questions. It presents case examples generated from interviews with Japanese managers in Japan, Europe and the USA, contextualising their comments by reference to recent research in the fields of international and intercultural management. The book explains how and why individual managers variously perceive threats or opportunities in the business and career environments currently evolving both inside and outside Japan. It combines vivid images of the expected and the exceptional, the traditional with the new and unfamiliar. The Changing Face of Japanese Management offers management students with little prior knowledge of Japanese business and society, critical insights into what is happening inside Japanese management today. 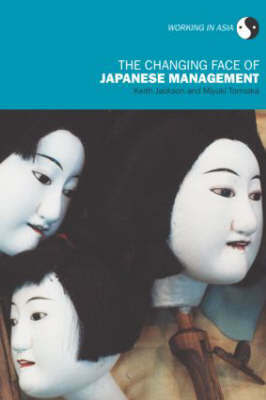 It also offers clear and immediately transferable insights to management practitioners who are preparing to work or negotiate with Japanese business partners. "For many Western managers, the approach taken by successful Japanese firms and their managers has tended to inspire awe, envy, and incomprehension in equal measure. This text addresses the question of what is so special about Japanese management and how it has responded to global business pressures.."